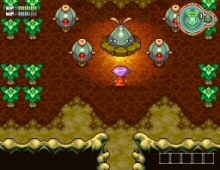 Rakuen no Guardian is a superb Zelda clone from E. "Buster" Hashimoto, a Japanese programmer who is best known in the freeware world for Akuji the Demon, a superb platformer/RPG title that has been translated in English. Like Akuji, Rakuen no Guardian blends excellent graphics and music with a nice story and neat physical puzzles to create a fun game. A great variety of weapons, spells, bosses, and clever puzzles will delight Zelda fans while attracting new ones. Although the game is in Japanese only, it is not hard to finish due to the fact that most puzzles are of the block-pushing, new-weapon-using variety as in most Zelda games. Like Akuji the Demon, expect to be pleasantly surprised with cool weapons and spells you will discover in later stages. Two thumbs up, way up!